Wrought Iron and Steel Fire Pits tend to rust, pit, and fail after a few years out in the elements, as these metals have a hard time with the abuse of regular fires and outdoor exposure. After buying several of these, savvy shoppers may find themselves looking for alternatives. This is where copper fire pit bowls come in. 100% copper fire bowls will not rust or pit, and can handle the elements with ease. They look beautiful and will last for decades. After a thorough examination of several copper fire pits on the market today, we have determined that the best Copper Fire Pit Bowl is the Titan Premium 40″ Copper Fire Bowl [Amazon Link]. It is quite expensive, after purchasing all the extras typically desired, but this fire bowl is very well built, extremely high quality, and designed to last for decades. For a complete review of this fire bowl, see our product reviews section below. Though the CobraCo SH101 Fire Pit Bowl [Amazon Link] has a much narrower diameter than the Titan 40″ bowl above, at 30″ diameter, its significant depth makes it capable of handling large fires. This fire bowl is made of hand-hammered copper with a steel base and features elegant modern lines and a timeless look. Also included are a spark screen and cover, making this bowl a great option given its price point. For a complete review of this bowl, see below. 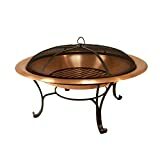 For those who want to stick to a budget but are still looking for a copper fire bowl, the Titan 39″ fire pit bowl [Amazon Link] is an outstanding choice. Unlike the Titan Premium copper fire bowl, this unit comes with most everything you need to use your fire bowl, including a spark screen and fire tool. The sizable width of this bowl makes it feel quite substantial, though the shallow depth of the unit is a bit of a letdown. Overall, this is an excellent budget choice. For a full review of this Titan Copper Fire Pit, see below. Titan Great Outdoors - Misc. In this section, we will look at several different copper fire pits on the market. We will consider the designs, included extras, size, and functionality of each unit, and determine our favorites. The Catalina Creations solid copper fire pit is a simple, classic design with a lovely textured copper bowl and simple metal frame. It is timeless and modern and will look stunning in any location. The Catalina Creations fire pit comes in three sizes, with the larger sizes able to accommodate larger logs, and able to make larger fires. The copper finish of this bowl starts out the bright, shiny color of fresh copper. However, over time and use, this copper bowl will develop a patina that makes it quite beautiful. This bowl is 100% copper, and will not rust. There is no drainage hole in these fire pit bowls, so it is wise to use the cover in use. Also, be sure the fire pit is cool before placing the cover on! All three of the stands result in a fire pit that sits pretty low to the ground (between 12″ – 17″, and consequently, if people are seated in chairs around the fire bowl, they may get smoke blown in their face as the wind changes direction. Longer legs would be nice, in our opinion. Buyers should keep in mind that the dimensions of the three bowls are the entire bowl diameter. The lip along the edge is about 4-5″ wide, so the bowl diameter where the wood goes is smaller than the full diameter. All of the options should be able to fit full sized cordwood logs. This fire pit is safe to cook food (probably marshmallows for s’mores) on, and the melting point of copper is way above what would be traditionally achieved in a wood burning firepit. Overall the Catalina Creations line of copper fire pit bowls is a good choice, with a simple, relatively modern look, and useful functionality. The ember screen is not the best quality out there, and over time will likely develop holes. But otherwise, this is a high-quality copper fire pit set at a great price point. We wish it was a little taller, though. The CobraCo SH101 Copper Fire Pit with screen and cover is a beautiful hand hammered timeless modern fire pit. It features a solid copper bowl with an extra-deep design, and a handsome sturdy metal stand to keep it off of the ground. The CobraCo SH101 is a large, deep fire bowl that can accommodate a large quantity of wood, can make a pretty big fire. It looks gorgeous, with a hand-hammered finish that will gradually weather into the classic copper patina with use and exposure to the air. This bowl feels timeless in its design, as the copper material and the modern design of the base work together in a very elegant way. The fire bowl is copper, and will not rust. However, the stand will certainly weather and rust over time, and you may want to periodically spray it with a Rustoleum high heat spray [Amazon Link]. No interior grate is included with this copper fire pit bowl. You may want to place a layer of sand at the bottom of the fire pit to create a buffer between the wood and the bottom copper layer for protection, and to make cleaning easier. We wish that this copper fire bowl sat higher up off the ground. With a bowl height of less than 12″, it sits very low to the ground, and if people are sitting in chairs around it, the bowl is significantly lower than those in its vicinity. Smoke from the bowl at that height tends to blow around more than it would if the bowl was higher. The bottom of the bowl is about 3.5″ off of the ground, and should not be used on a wooden deck. It will leave scorch marks, and there’s always a risk of fire due to embers escaping the screen. There is no drainage hole in this copper fire pit, so be sure you use the included cover when the unit is not being used. If you don’t, you may find the bowl filled with water, and turning a bowl of water that sized is heavy! Also, be sure your bowl is cool before placing the protective cover on the unit. That said, the vinyl cover is not the best quality, so you may find yourself shopping for a separate, higher quality, fire pit cover for this beauty in a year or so. The CobraCo SH101 Fire Pit Bowl is a beautiful copper fire bowl with a large basin and elegant modern design. The price point it hits is not bad, given the quality of the components and the winning style. We wish this bowl sat a little bit higher off of the ground, and users may find the spark screen and vinyl cover deteriorate faster than they would like, but the bowl itself is beautiful, and will certainly be long-lived. This is a great choice for a copper fire bowl. The Titan 40″ Solid Copper fire bowl is quite stylish and large, with a very modern look and an elegant design. It is very big but does not include some of the extras that many of the other fire bowls on our list have. The Titan 40″ copper fire bowl is a beautiful, high-quality item at a top price point. Comparing prices directly against the other items on our list is a bit inaccurate, as users will probably want to purchase an ember screen and a vinyl cover, which pushes the total cost of this fire bowl to almost double the competition. But it is extremely well made, and it feels like a quality product in all ways. An ember screen is not included with this fire bowl. 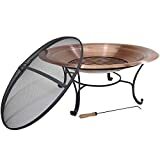 There are a few available screens out there, but one decent choice is this 36″ Hampton Bazaar fire pit screen [Amazon Link] which will fit this fire pit (the 40″ one is too large). However, it is pricey! This fire pit does now feature drainage holes, which is helpful, as no cover is included. If any water gets in the bowl, the holes will drain it out. However, it still seems wise to us to get a fire pit cover for this unit. Even though the materials should be long-lived, a cover is always a good investment. There is no assembly needed for this fire bowl, which is a nice feature. The Titan 40″ copper fire pit bowl is a top quality product, at a high price. It is large, really well made, and beautiful to look at. It will likely last for decades if properly treated. However, it’s expensive and does not include several extras like a spark screen and cover that come included on many other fire pit bowls. Once these extras are purchased, this fire pit is hard to beat, except for the cost! The CobraCo FTCOPVINT-C copper fire pit could probably use a more marketing-friendly name, but there it is. This fire bowl is essentially the same as the SH101 fire bowl above, with a different stand. The good news is that this stand brings the fire bowl up off the ground a little more. But the bad news is that it’s nowhere near as modern looking, and could use a trip back to the drawing board. The CobraCo FTCOPVINT-C is a high quality, attractive fire pit with a hand hammered solid copper fire bowl, and an included grate to improve airflow and fire quality, compared to the SH101 above. That said, we still recommend putting about 1-2″ of sand at the bottom of the bowl and consider using a brick to lift the grate up a little bit off of the bottom of the bowl to keep air flowing nicely. We don’t love the wrought iron base, but it is functional and helps keep the bowl a little higher off the ground than the SH101. The CobraCo FTCOPVINT-C fire bowl would be a nice choice for meal preparation, though you will need a fire pit grate for cooking to make cooking most foods practical. This fire bowl set includes the copper bowl, wrought iron stand, wrought iron inner grate, spark screen, fire tool, and vinyl cover. The inclusion of all of these items makes this set a fully featured package, at an aggressive price point. The CobraCo FTCOPVINT-C Copper Fire Pit set has everything included that users need to have a fully functional fire pit, but it’s hard to get too excited about this one. The Copper fire bowl looks great, but the base is not as stylish as we would like. The cover is included, but it isn’t the highest quality. And the price point of this set is noticeably higher than the CobraCo SH101 above, which we like better. Unless you love the included interior grate, and the design of the base, we would suggest buyers skip this one. The Titan 39″ solid copper fire bowl has a fairly close diameter to the 40″ Titan bowl above, but it is significantly inferior in many other ways. However, it’s also positioned at a much lower price point, which can’t be ignored! Also, this set includes most everything needed to use and care for this bowl for years to come. The Titan 39″ Fire Bowl is a huge step down from the 40″ Premium fire bowl mentioned above, but as a package, is quite compelling for its price point. The copper is not as thick, and the bowl is not as deep, as the 40″ premium model. But included in the package is a spark screen and fire tool, which makes this package a pretty good deal. The base is pretty thin looking to our eyes and is not particularly modern in its design. But it’s fine for this price point, especially given the large diameter of this fire bowl. The fire bowl itself is fairly shallow, and a grate is included which further limits the depth of the bowl. However, the width of the whole copper fire bowl is wide, and this unit can still burn fairly large logs. The grate helps air flow through the unit, and the spark screen is a nice safety feature. The Titan 39″ Copper fire bowl isn’t the most beautiful bowl in our list today. It doesn’t have any outstanding features other than the width of the bowl and the price point. These units are a big step down in quality from the Titan 40″ Premium fire bowls, but are also a huge step down in price! Overall these fire bowls are a great budget-friendly choice for those looking for a large copper fire pit that doesn’t break the bank. All of the copper fire bowls on our list today have their advantages and disadvantages, but regardless of everything else, these units are built to last outside! This strength and durability are what makes a copper fire pit so much more attractive than a steel or iron fire pit, and the lovely beauty of copper can’t be beaten. We would suggest starting your quest for the best copper fire bowl with the Titan 40″ Bowl, but any of the items on our list today are solid.